Almost two years ago I had to make a tough decision, like many of you have had to do as well. And it wasn’t easy. It was a decision we’ve had to make several times before, and each time it’s awful. For those of you who are pet lovers, you’ll understand what I’m talking about very quickly. Because our fur babies are part of our family, from the first moment we bring them home. They jump into our hearts and make their nest, and we quickly wonder what we ever did without them. And all too soon, we end up saying a tearful good bye. Because their lifespans are much shorter than people’s, and even though we know that from the beginning, we still pour our hearts and our love into each one of our special pets. And they do the same for us. Over the years I’ve had both dogs and cats. I’ve loved each and every one of them, and cried buckets of tears when it was time to say goodbye. It was really bad when just two weeks after our daughter’s wedding, we had to say goodbye to Angel dog, my mother’s Pekingese that we had cared for since my mom’s death ten years before. I felt like I was losing the last part of my mother I still had left. As I was crying and sobbing, my dear husband told me he could just picture little Angel running on her now arthritis-free legs, right up to the door of my mom’s heavenly mansion and barking to be let in, and happily joining my mom’s other dogs she’d had over the years that had been waiting for her at the Rainbow Bridge. I can only imagine what a wonderful furry reunion that must have been! But I was still heartbroken…. Then a year later I had to say a very teary goodbye to my very favorite cat, Princess, a beautiful black tortoiseshell Persian with curly whiskers and the most wonderful purr I’d ever heard. I put off the decision as long as I could, but sadly I finally had no choice but to let her go to the Rainbow Bridge. Again, I was heartbroken, but before she left, Princess gave me a promise that she’d send me a new kitty that looked just like her. 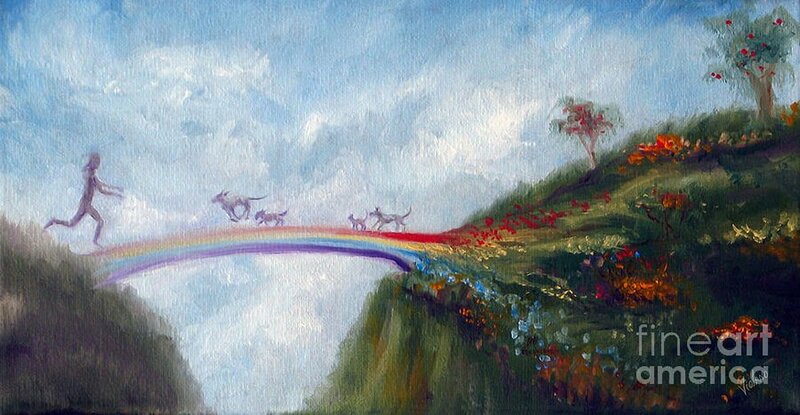 And she told me all about the Rainbow Bridge where pets go when they pass on to their next life, waiting for us to join them, or going to meet their owners who have already left them for their heavenly home. And I held on to her promise. I didn’t realize how it would turn out, though. And certainly it wasn’t like I’d thought. You see, Princess had promised to send me a kitty just like her. I tried and tried, with no success, to find the one she’d promised me. She was nowhere to be found. But what I didn’t know, was that all along Princess Kitty had had something better in mind, and she just didn’t want to spoil the surprise she had for me. And she knew I wouldn’t mind if she changed things around a bit. About a year ago I was involved in an auto accident. It was a bad one, and it threw me into a depression I hadn’t expected. It affected me in ways I never expected. And I needed something to bring me out of my funk. But nothing seemed to be able to help. 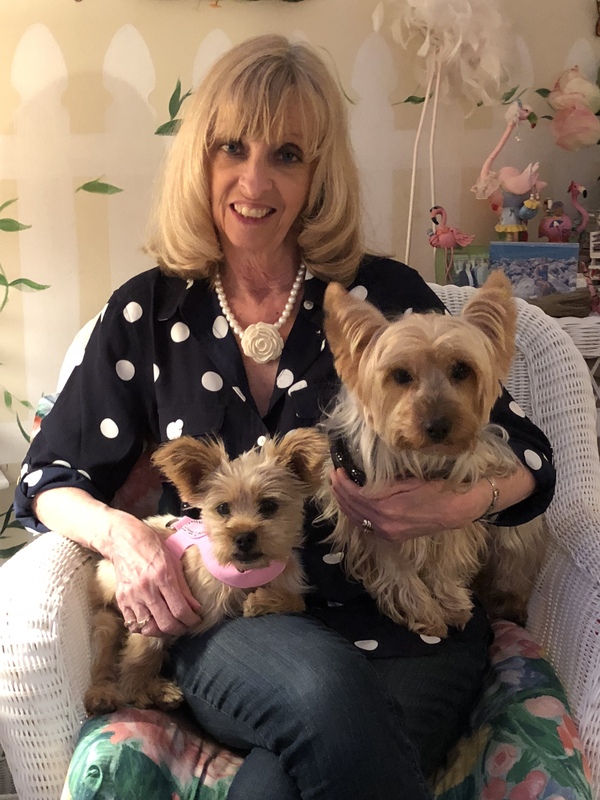 And then, out of the blue, a friend of mine posted on her Facebook page that she needed a new home for her Yorkie, because she just couldn’t keep him any more. He needed a home where he could run outside and play, where he would have people who’d love him as much as she did, but could give him the attention he deserved. Now I’ve always had a thing for Yorkies; I’ve always wanted one. For about 40 years, but who’s counting? What an opportunity! Of course I immediately contacted her! Obviously Princess Kitty had planned a surprise for me I’d never expected. As much as I love our kitties, I also love Yorkies, and this was my chance! And two days later, Benji joined our family. I don’t know who was happier, my husband or me. Because Benji’s an awesome dog, perfect for us, sweet and loving and loyal. Plus he’s willing to put up with my dressing him in doggie t shirts and bandanas, and taking his picture with Santa and the Easter Bunny! I knew Princess had sent him to us. She knew how much I’d always wanted a Yorkie, and she took care of it. And maybe she just didn’t want us to have another kitty who looked like her. Because she really was one of a kind. As much as we adore our Benji we felt guilty leaving him all by himself while we went to work. He needed a friend. So a few months ago the search began for a sister for Benji. And it wasn’t easy. It had to be the right doggie, younger, but not too young. A little girl dog who needed a new home, and a big brother to show her around, to protect her. Someone to play with, and to go squirrel hunting with. A doggie who needed to be rescued. But suddenly after three months of searching, we had the opportunity to get Benji a sister. Someone had turned in a 4 month old little girl Yorkie-Shih tzu mix to a local animal shelter. She’d been spayed, and would be up for adoption the next day. As soon as we saw her picture I knew she was perfect! And that Benji would be really happy with her. We just had to make it happen. Come on Princess Kitty, help us out here! You promised! The shelter opened the next day at noon. My husband Ben was there by 11:45 and there were already 14 people ahead of him in line. Most of them wanting this particular dog. But one by one people started dropping out of line. Some didn’t want to wait until noon to go in, and some didn’t want to pay the $100 adoption fee! When the shelter opened everyone went in and had an opportunity to look at the dog they wanted from a distance, and then fill out an application for adoption. Afterwards everyone went in one on one to play with the dog for a few minutes. The first people came out a few minutes later and said they’d decided on a bigger dog. While Ben and the other lady were waiting for their turns they had been talking, and he’d told her he wanted to get the dog for his wife’s birthday gift, and how our other dog needed a playmate! When the lady went in to play with the doggie, it seemed like she was in there forever. All this time I was waiting to hear from Ben, and…nothing. I just knew it wasn’t going to happen. I was a nervous wreck…and I’d not even seen this little one in person! An hour and a half later I finally met little Chloe in person. She was sitting in the front seat of Ben’s car, wagging her tail at us, and smiling like only a newly rescued puppy can smile! She knew she finally had her fur-ever home! And now Benji has a little sister, who’s already following him everywhere, sleeping beside him, and yes, irritating him on occasion. Because that’s what little sisters do. Princess Kitty kept her promise to me, and although she didn’t send me another kitty that looked like her, she sent us two wonderful furry friends that have already taken over our house, filling it with more love, assorted dog toys mixed among our granddaughter’s toys, and a jar of dog treats sitting on the counter beside the (human) cookie jar. Princess Kitty kept her promise in her own way. After all, cats do their own thing, and make their own rules. They keep their promises, but sometimes in their own way. And I have to say. I’m thrilled at the way she kept her promise. Benji and Chloe are the perfect pair of dogs for us. We couldn’t be happier at the way Princess worked things out! And one day when we see Princess again, we’ll be able to thank her in person! Note: If you’re looking for a fur-ever friend, whether it’s a dog or cat, please consider your local animal shelter, SPCA, or rescue organization. They have many animals looking for a loving, fur-ever home. You won’t be disappointed. Want to read the other stories in this series?